People are going online to find the news. The chart is pretty straightforward. You have a realization that people are going online to get the news. Yes, TV is still number one and appears to be staying that way. People have too much invested in TV for the short-term to move away, but the digital world is catching up and catching up fast. The chart leaves out the fact that this shift is largely generation-based. Here is what this research means for your business. If you are looking to earn the attention of people and you’re looking for younger customers then you need to go online. Create a website and setup a blog. There is an opportunity to provide news content and news interpretation content. People will find your content via search and social and the overall awareness around your brand will increase. Now, reporting the news is a tough game. A business can’t really do that outside of the news about their own company. What you can provide, though, is news interpretation. You can provide a point of view on the latest news happening in your industry. Give your readers an understanding and they’ll come to your site often. Here at GBW we focus on being the best at blogging, but people are going online for all types of content. While people are still watching TV as much as ever they are going online to watch video too. Create video content for your website. People are looking for it and in the future it will become an expectation to have video on your site if you’re looking to win attention. It won’t be completely necessary to have video on your site to be successful, but many people will want to see it. People will read about the news to find out what’s happening, but more than ever people are looking for suggestions on what they should be doing. This can relate to the news or to their lives in general. Whoever can provide those suggestions and direction will win attention on the web. This means telling people what to do based on your experience in your industry and in life. If you can provide an understanding of the news and give insight that allows people to live a better life you’ll win the game in the online world. 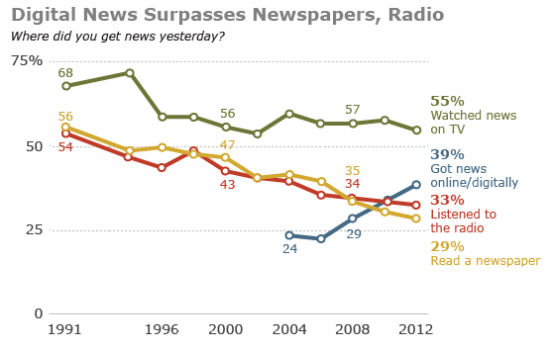 More people are going online for news and for all types of content. If your business wants to be in the online world you’ll have to make sure you’re doing the right things. Follow the suggestions above and you should get a good start in your online strategy.